Wearables™ by Kid Constructions™ is the unique collection of creative constructible toys that puts a new twist on a classic play pattern. A Parents’ Choice Approved Award Winner! Encourage children and grown-ups to put down the TV remote, step away from the computer and engage in an activity which allows for their imaginations to take flight. Wearables™ by Kid Constructions™ is the unique collection of creative constructible toys that puts a new twist on a classic play pattern. Featuring multiple die-cut corrugated pieces, Wearables offer construction play that transforms into role-play as children create, construct and wear their creations. All the elements combine for creative, crafting, imaginative, and active play that encourages fun, quality family time. Create Construct and Wear. My daughter is a budding Picasso she just loves to draw. To her drawing is fun, and it is something she loves to do. When she found out that she was able to review a Wearables 3D art toy she was so excited! A Wearable is not only a great art project it is also a toy a 3-dimensional costume that your child can wear again and again. What fun! My daughter is a huge Disney princess fan (she gets it naturally from me) and to be able to make a carrage and decorate it however she liked was a big deal to her. She had to get it just right, make it as beautiful and perfect as she can (she can be such a perfectionist at times) she loved decorating this and I had fun helping her put the finished product together. This is sturdy and is built to last. So if you have a little one who loves art and loves to dress up (what kid doesn’t like to dress up?) they will just love creating their own wonderful piece of artwork and wearing it as they use their imagination to have fun and play. This is so much better than just sitting and watching TV or playing endless house of video games. I love that this craft got my daughter up and thinking, how would she decorate it, what princess should she be? And then it was time to wear her completed craft. 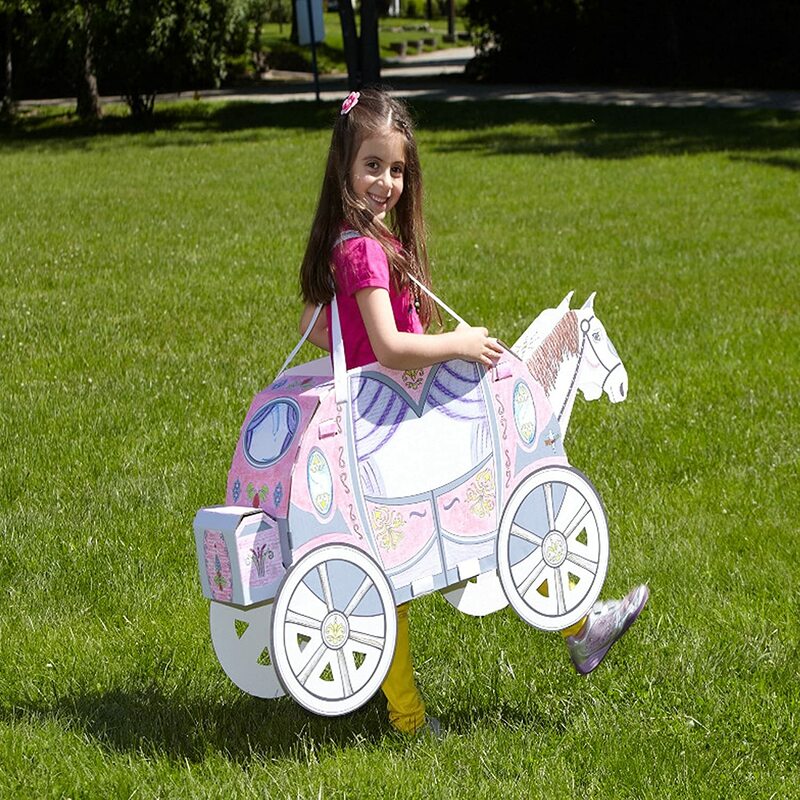 Time to be that princess in the carriage, this was a great toy that my daughter just loved. I can see her playing with her lovely carriage for years to come. So if you are looking for a great gift idea for kids ages 4-10 a Wearable is an awesomely different and fun gift. Priced at under $30, Wearables this is affordable gift kids will love. The generous folks ay Wearables are giving one of Susan’s Disney Family readers a chance to win a Wearables Product a Wearables Plane, Carriage or Dozer. Would you like to win? Please let me know what Wearable you would choose if you won? There are also other ways to enter. Please enter below. Disclosure: The reviews and or opinions on this blog are my own opinions . I received a wearables to review. No monitory compensation was received. I was not required to write a positive review. Your experience may differ. The opinions I have expressed are my own I am disclosing this in accordance with the Federal Trade Commissions 16 CFR Part 255: Guides Concerning the Use of Endorsement and Testimonials in Advertising . The princess carriage is so cute! my daughter would love it!